An obituary in the New York Times says, �Elizabeth Wiley Corbett was widely known as the first (American) woman doctor.� She began practicing medicine when she was about 22 and continued until her death. ■ Elizabeth Jane Wiley was born July 10, 1833, on a farm near Kent, Indiana. She was Scottish on both sides of her family. Her great grandfather emigrated to Virginia just before the American Revolution. Her mother was a Maxwell whose forebears included Weirs and Campbells from southern Scotland. ■ Higher education for women was not commonplace in America during the early 1800s. Elizabeth was expected to stay home sewing, weaving, cooking, and scrubbing while her brothers attended school. She read their textbooks and soon was being tutored by her self-educated father, Preston P. Wiley. When her mother was stricken with typhoid, she determined at age 14 that she was going to be a physician to alleviate suffering. 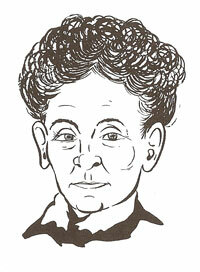 ■ Refused admission to the nearby all-male Hanover College because she was female, she entered Antioch College in Ohio. Here she had a chance to meet the famed educator Horace Mann, the college president. Finishing there, she enrolled in a small uncertified medical school in New York. She moved to San Francisco and started her medical practice. It was not until 1870 that she received her M.D. degree from the University of Michigan. ■ She married another physician, Dr. Samuel Corbett, and spent much of her later life fighting the entrenched prejudice against women doctors. Much of her time was devoted to the medical problems of women and children in gynecology, obstetrics, and pediatrics. She died in Washington, D. C., on June 4, 1916.